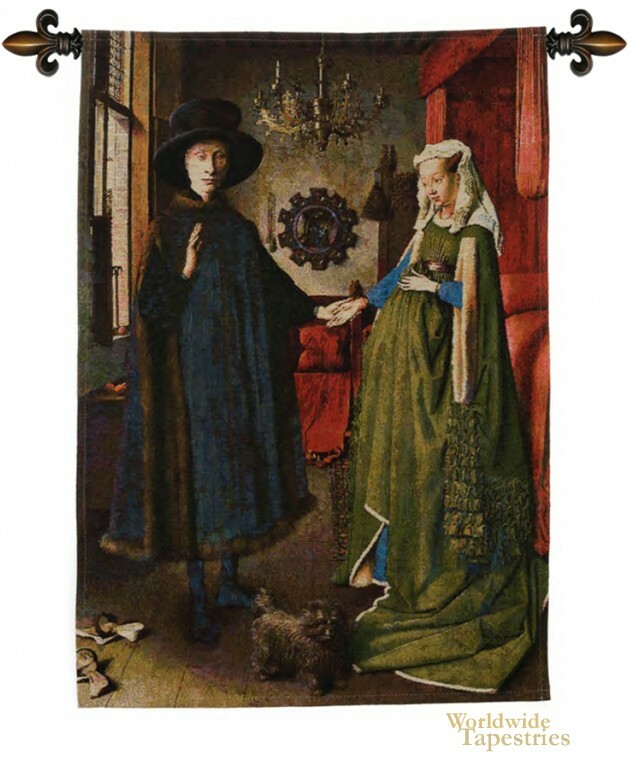 The Arnolfini Portrait tapestry is based on the distinctive work of Jan van Eyck from the Netherlands from 1434. Here we see a portrait of Giovanni di Nicolao Arnolfini and his wife, likely in their home in the Flemish city of Bruges. The Latin signature translates to the words 'Jan van Eyck was here 1434' which is the way he signs off on his works. Arnolfini was part of a powerful family from Tuscany who specialised in producing expensive cloths. Here we see the lady who looks as if she is pregnant though scholars say she is not and is instead holding up her full length gown. Their pet dog is in the foreground to anchor this double portrait to the center of the work. This piece is masterful in its use of light and color and uses a fascinating expression of his subjects from her looking at him, to him looking at the viewer. The Ballerina Dance Foyer tapestry is backed with a lining and a tunnel for easy hanging. Note: tapestry rods and tassels, where pictured, are not included in the price.